People spent three hours trying to break him free — but they never gave up. It was lucky anyone at all spotted a giraffe in trouble in a remote region of Kenya — if he hadn't been found, he might have lost his life. 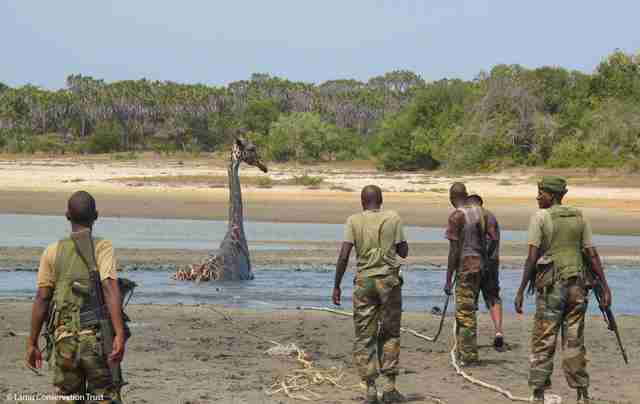 The huge giraffe had become stuck in mud near Amu Ranch, run by the Lamu Conservation Trust, on the northern coast of Kenya. 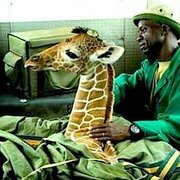 And even though the enormous animal towered over the rescuers from the Amu Patrol Team and the Kenya Wildlife Service (KWS) who came to help him, they never gave up. 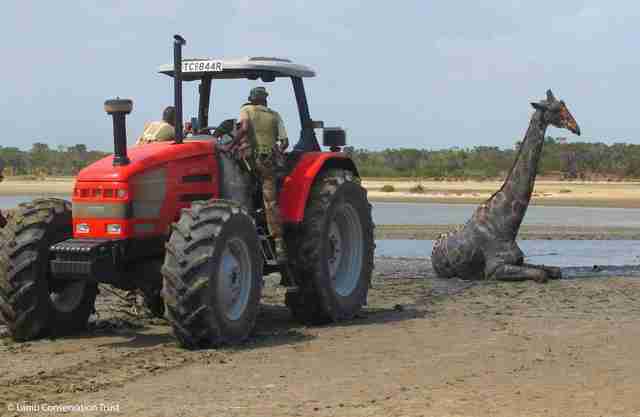 Luckily, a tractor donated by the David Sheldrick Wildlife Trust (DSWT) was a big help in helping this big guy out of the mud. Saving the giraffe wasn't just an act of kindness — it was also a little step toward helping giraffes as a species. Over the past three decades, giraffe populations have plummeted by nearly 40 percent, from about 163,000 in 1985 to just over 97,000 in 2015. 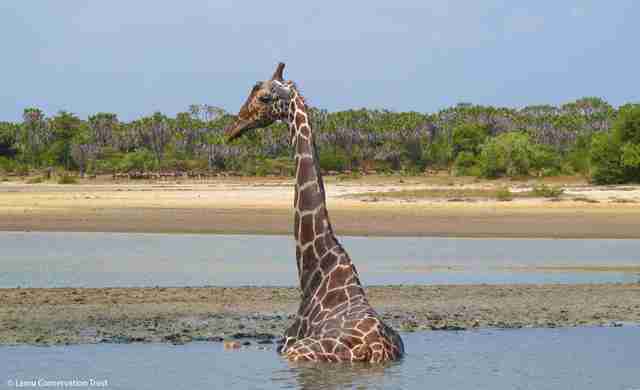 "The main threats facing giraffes are habitat destruction, bushmeat poaching and human-wildlife conflict," Amie Alden, spokesperson for DSWT, told The Dodo. "Few people know that these iconic species are under threat and that, in localized areas, giraffes could soon be driven to extinction. Many are caught in poachers' traps and snares and face a slow and agonizing death if rescuers like our Vet Units can’t reach them." Rescuers from DSWT have helped the KWS with over 180 giraffe rescues to date, saving them from snares and treating spear and arrow wounds — and, in this case, pulling them out of a tight spot. 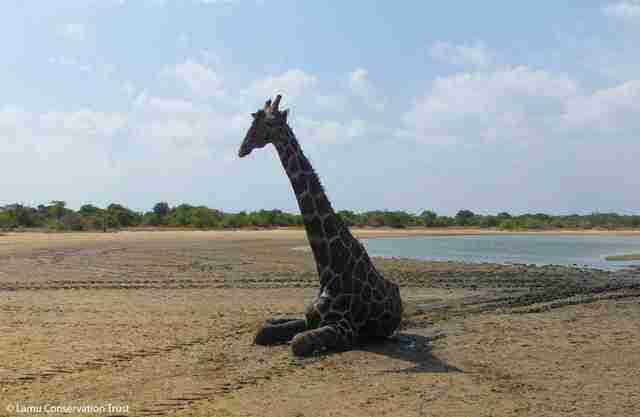 After three hours of gruelingly difficult labor, the rescuers managed to pull the giraffe out of the mud. And he took a moment to rest on solid ground before walking off — almost like nothing happened. You can help save more vulnerable giraffes and other wild animals in Kenya by making a donation to the David Sheldrick Wildlife Trust.